Located on the edge of West Yellowstone, about .8 miles from downtown, Stormhold is a rustic 5-bedroom cabin with the national forest as its' backyard! 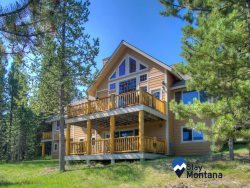 This beautiful home is perfect for traveling groups and family events, and provides easy access to Yellowstone National Park. The home is very spacious with all the amenities. The fireplace is wonderful to curl up next to after a long day of site seeing and exploring all the Park has to offer, while the seating area on the porch provides a wonderful place to host evening events with friends.